GraceConnect » Here Come the Grace Students! Here Come the Grace Students! Here come the college students! 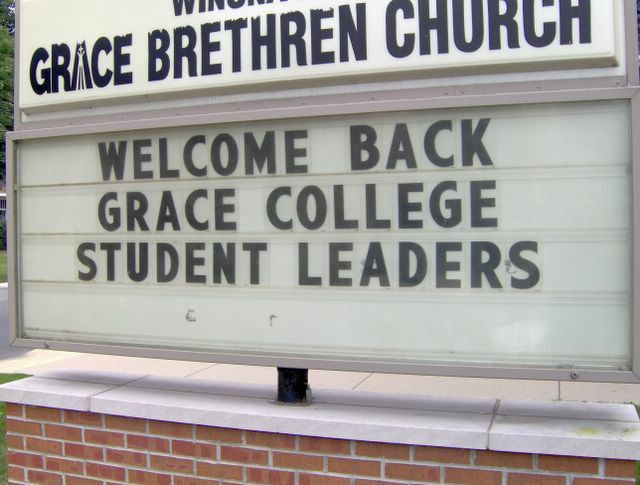 Grace College and Seminary, Winona Lake, IN, are about to begin another academic year. Students leaders are already on campus for training, and new student orientation takes place August 20-23. Welcome Weekend is an orientation time for new and transfer students, led by the student development staff and about 150 student leaders. Among the services offered are free airport shuttles on August 19 to the campus from the South Bend and Fort Wayne airports. Registration begins Saturday, August 20. “Welcome to Grace and Presidential Address” is Saturday evening, followed by “Freshman Follies.” Sunday morning there is a worship service at Rodeheaver Auditorium and after a variety of afternoon activities parents depart at 5 p.m.
Sunday evening is “connection groups in homes” and transfer students have a dessert at a faculty member’s home. Monday includes a number of advising and assessment meetings, followed by a concert by “Down Here” in the evening. Classes begin Tuesday, August 23. More information is available on the Grace website.